I love synergies in my products. I like it that I can take dates sent to my Gmail and copy them into my Google Calendar. This time, I want to tell you about a few of my favorite synergies with Remember the Milk, perhaps my favorite of all Internet Tools. If you’re unfamiliar with Remember the Milk, check out the Internet Tools Wiki article on it. Or just know that it’s an online to-do and task management system. Gmail: Via a Firefox extension, you can install Remember the Milk into your Gmail. You visit your Gmail all the time, so it makes sense to put your calendar and to-do list system on the same platform. You can copy links from your Gmail into RtM, update tasks, or connect with your mail contacts. Jott: By far my favorite synergy with Remember the Milk. Call Jott, tell them you want to Jott to Remember the Milk, and then add a task by voice to your to-do list. You can even specify the time and date, and thus get a reminder without ever looking on a computer. A lifesaver, especially when you’re on the road. Twitter: If you are a big Twitter user, then this is for you. 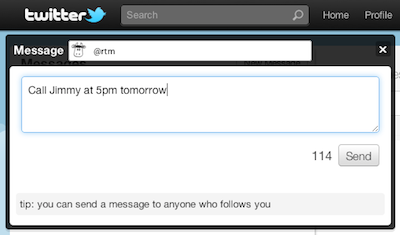 Send Twitter a direct message with your task and the time/date and it’ll appear in your RtM task list. Google Maps: It’s long been integrated with Remember the Milk. Add a location to your Remember the Milk and then you can use RtM to map out where you have to go during the day. Google Gears: Going to be in a place without Internet? Want to use Remember the Milk offline? Then just install Google Gears and you’ll be set! Google Calendar: Google Calendar and Remember the Milk have a lot of similarities, so it makes sense that they can work together. Send your RtM tasks into your Google Calendar so you can see everything in one interface. Blackberry: Again, it costs money, but MilkSync is the Blackberry version of Remember the Milk and is worth every cent. Plus the people at RtM are awesome, and why wouldn’t you want to support them?